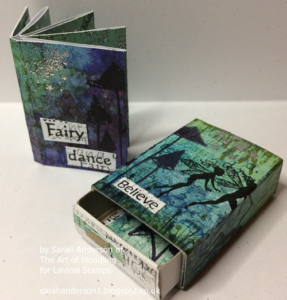 Book in a Box. 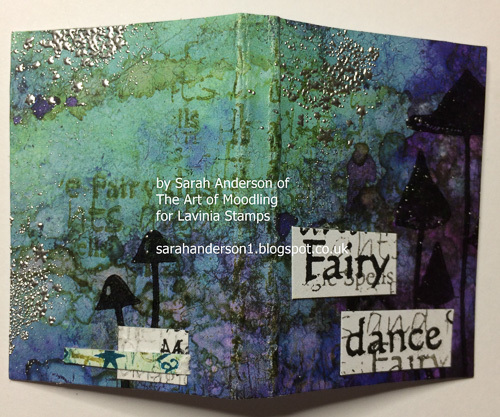 Another “How To Do It” article from Sarah Anderson as she gets creative using stamps and scenescapes from Lavinia Stamps. 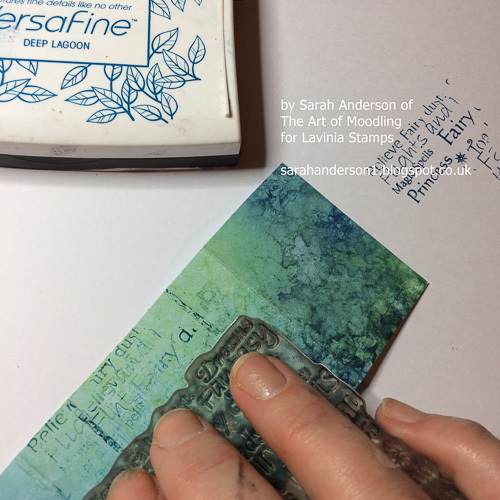 Lavinia Stamps Scene-scapes give a wonderful starting point for all kinds of projects, including book making – just add stamps! 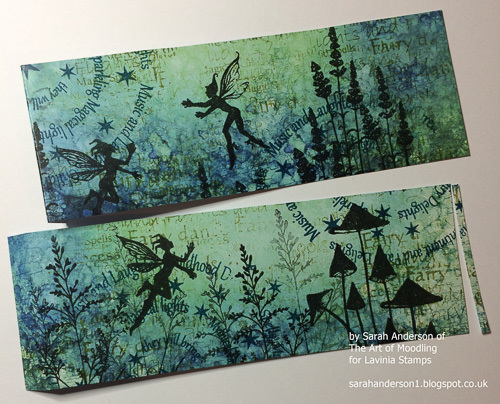 001 Trim a piece of Spellbound 1 Scene-scape to fit around the outside of a small matchbox. 002 Have a rummage in your collection of Lavinia Stamps for your tiniest stamps including text, foliage and fairies. 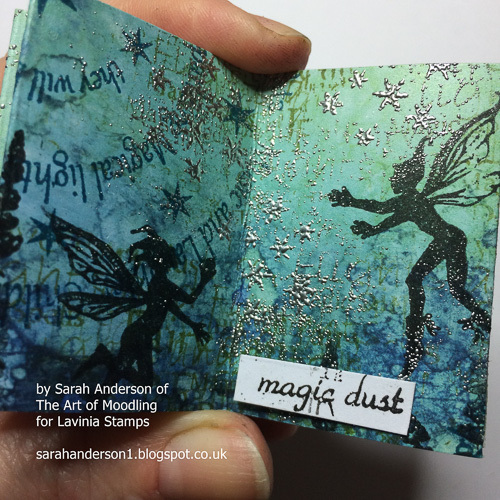 003 Stamp patches of ‘Fairy Words’ (or similar) using Versafine: Dark Lagoon ink on your card. 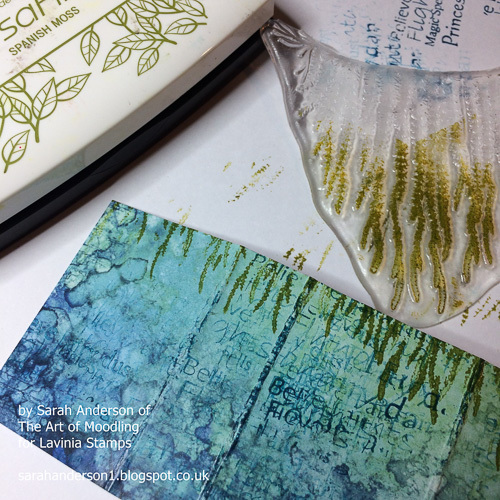 004 Ink up ‘Forest Spruce’ with Versafine: Spanish Moss and stamp it towards the top of your card. 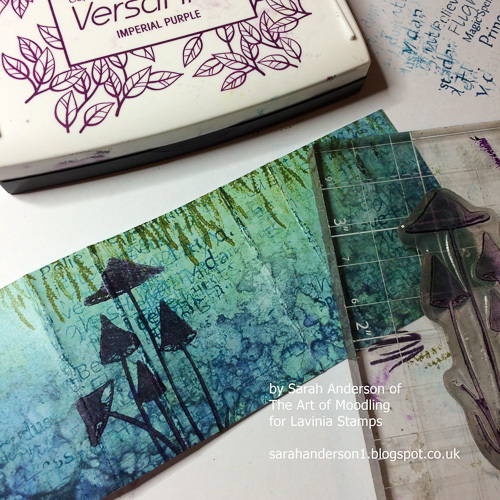 005 Stamp ‘Slender Mushrooms’ using Versafine: Imperial Purple so that they appear to the left of what will form the top of the matchbox. 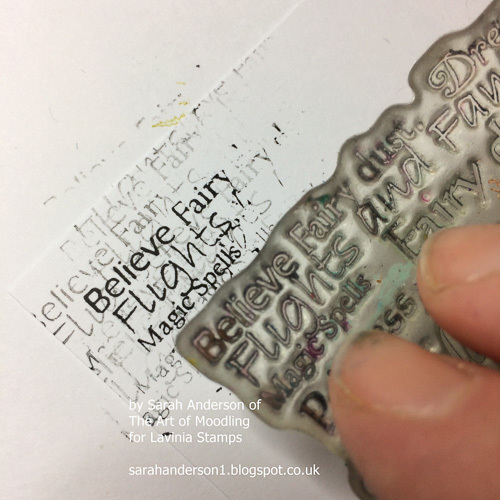 006 Use Versafine: Onyx Black to stamp ‘Small Fairy Chain’ so that some fairies appear on the top of the matchbox. 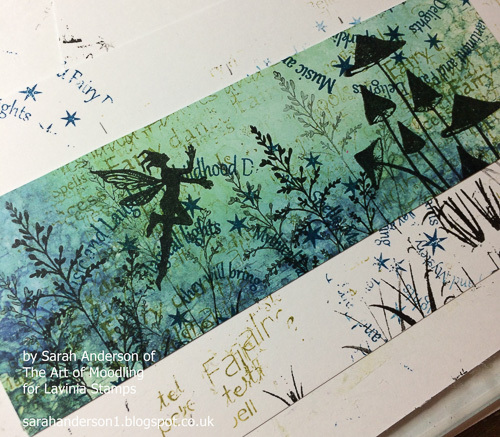 Create grass using the top of ‘Single Fairy Thistle’ with Versafine: Onyx Black and Spanish Moss. 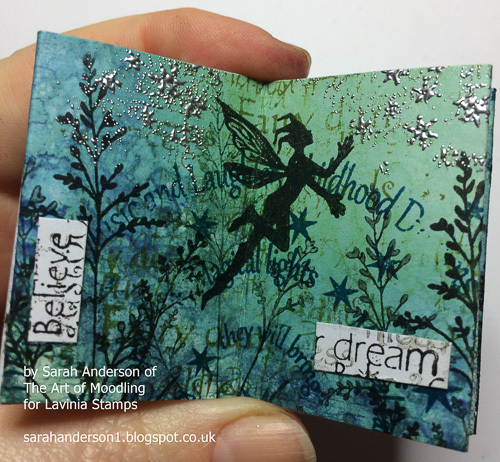 007 Stamp ‘Fairy Words’ repeatedly with Versafine: Onyx Black and trim around the word ‘Believe’. 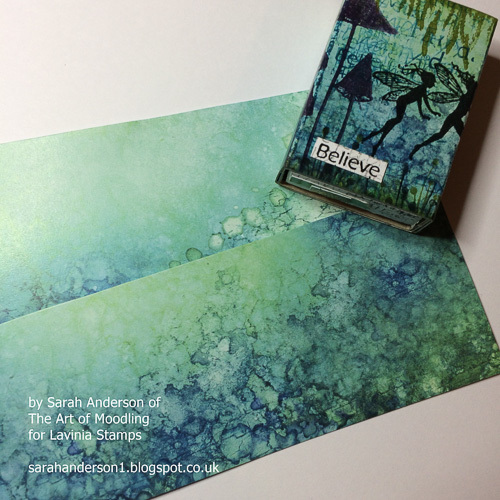 Glue the stamped card to the outer section of the matchbox and add the word ‘Believe’. 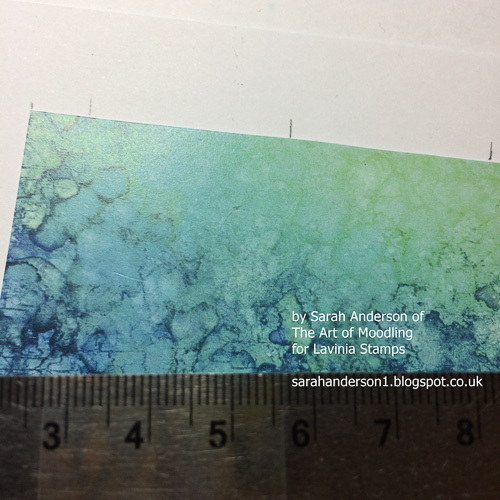 009 Mark 1cm, then ‘just short of the width of the matchbox’ (eg 2.7cm in my case) repeatedly along both lengths of card. Don’t fold this yet. 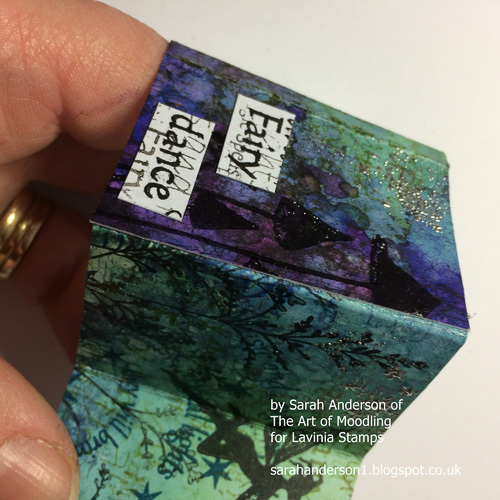 It’s always surprising how much smaller you need to cut your card to make the book fit within the matchbox so if you want to make a blank trial piece, please do. 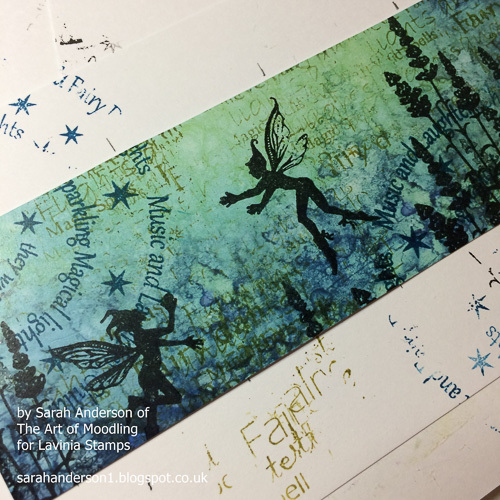 010 Stamp fairies and text as shown. 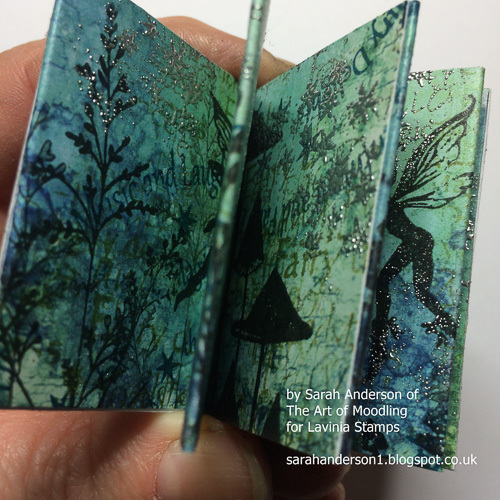 I kept my card lined up against my markings for the folds so I could work out how the images would look on the individual pages of the book. 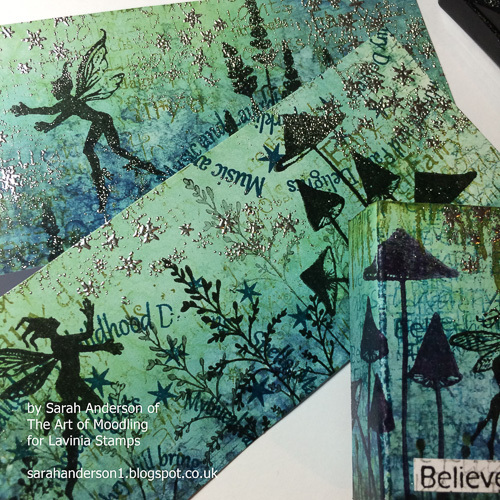 011 Repeat with the second strip of card. 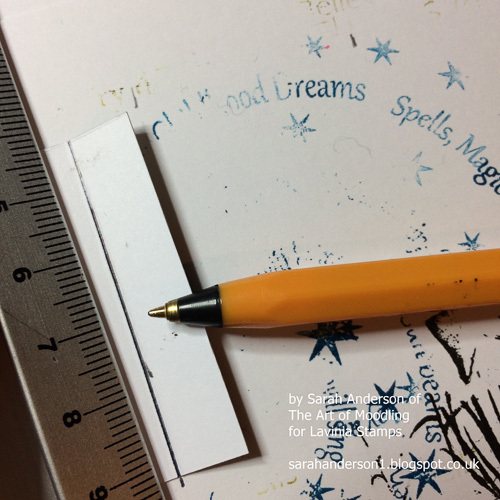 012 Score the back of the card using a fine bic biro (or similar!) and a ruler. This gives the folds a crisper line. 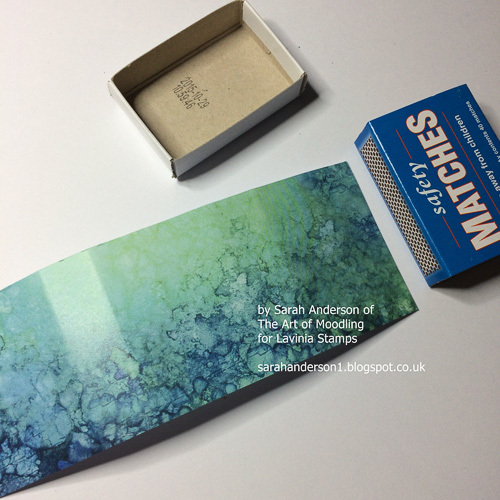 013 You may need to trim the end of the card so that when it is folded it has a 1cm flap followed by four ‘just short of the width of the matchbox’ size pages. 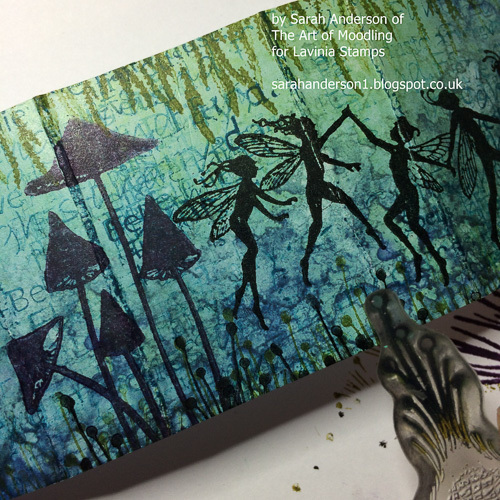 014 Emboss silver stars at the top of the card as shown. 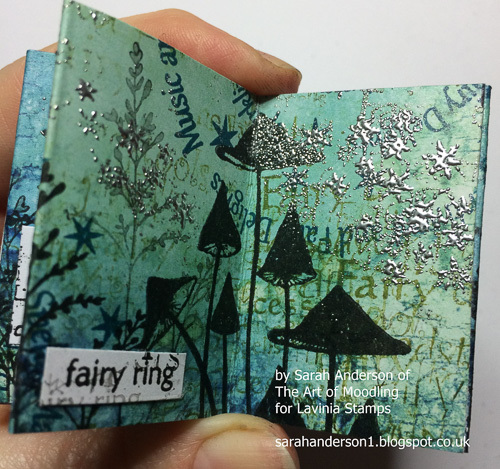 I liked this effect so much I then added it to the matchbox cover too. 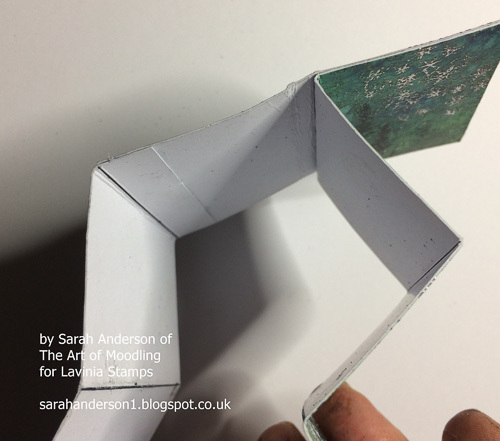 015 Attach the two lengths of card together by gluing the 1cm flap as shown. 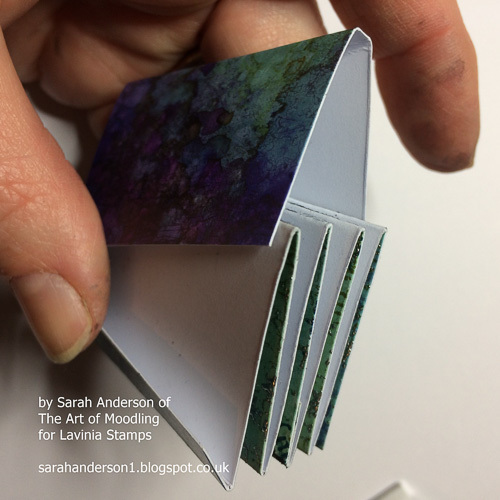 016 Fold this newly created single length of card like a concertina. 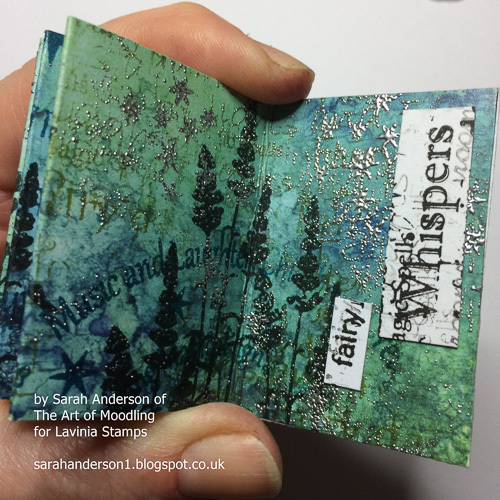 Trim a piece of Spellbound 2 Scene-scape to fit around this folded booklet. 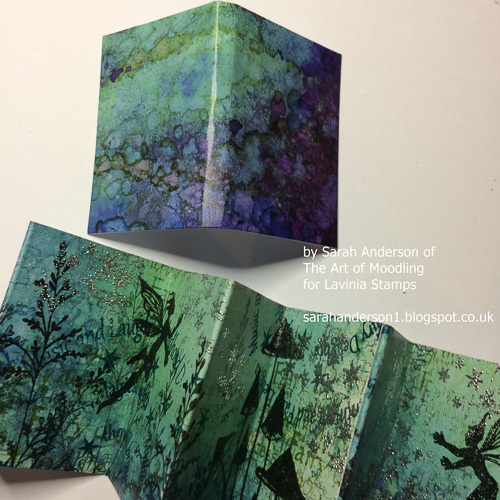 017 Once you’ve established the size of your book cover create sharp folds for the spine. 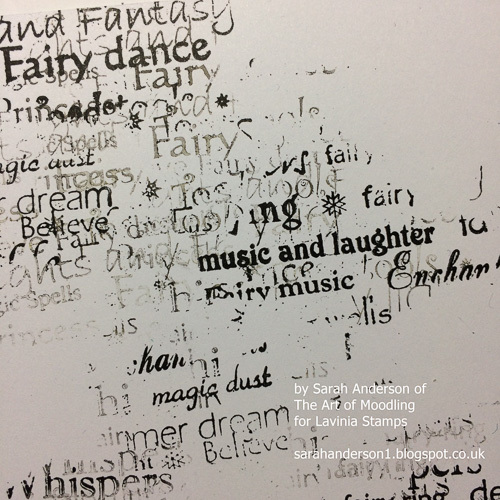 018 Stamp ‘Fairy Words’ repeatedly with Versafine: Onyx Black and trim key words that you would like to use both as the title of your book and within the pages. 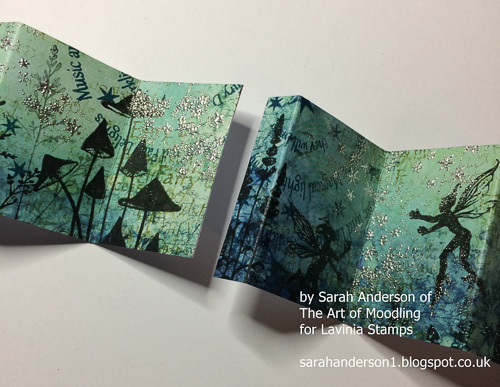 019 Add stamping to your book cover as well as the title. 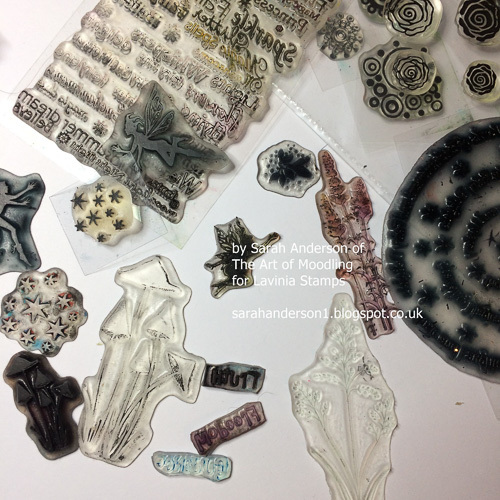 021 … and the last ‘page to the back of the book cover.